This Mustad 7" Fillet Knife with Sheath is constructed with high quality materials. The blade is made with high grade German stainless steel that is coated with DuPont™ Tef- lon® which adds corrosion resistance and allows the blade to slide effortlessly through the fillet. The handle features an ergonomic comfort design with a durable polypropylene soft, no-slip grip. 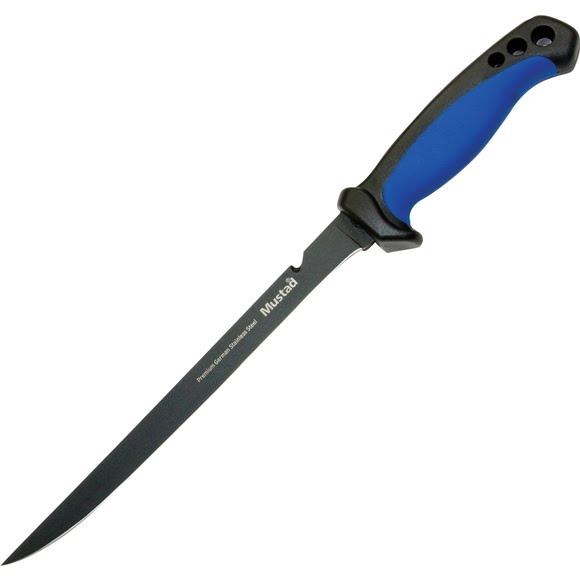 This Mustad 7" Fillet Knife with Sheath is constructed with high quality materials. The blade is made with high grade German stainless steel that is coated with DuPont™ Tef- lon® which adds corrosion resistance and allows the blade to slide effortlessly through the fillet. The handle features an ergonomic comfort design with a durable polypropylene soft, no-slip grip. This knife also includes a durable, rigid safety sheath with thumb lock and line cutting channel.